Do you have a TV in the same room as your piano? Well Genio is the answer to your problem. Get the best of both worlds now available in Perth Western Australia. The Genio Piano Silencer is the way to go. Digital piano in a real piano. Would you like to have an acoustic piano with all the great features of a digital piano? 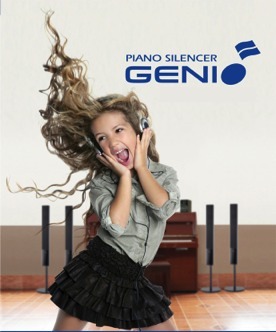 Such as: Genio piano silencer system. The ability to easily record your songs. MIDI Device input & output. USB port for USB memory stick. This product really does allow you to have the best of both worlds with a fantastic slim and sophisticated design plus the modern technology, You no longer have to choose between having a digital piano for all the extra features or having an acoustic piano for the touch, sound quality and over all feel. Installing the silencer into a real piano will allow you to play the piano through headphones, leaving you to enjoy playing the piano and does not disturb anyone around you. No matter what sort of piano you have, a grand piano or an upright piano, a new piano or an old piano, this Genio Silejnt piano system has something to offer you. When the Genio system is activated the silent play means the piano hammers no longer hit the strings. The digital processing unit is then capturing all the movements of the keys and you then hear this throught the headphones. The genio is the cherry on top of acoustic pianos. Prices are Indicative and Subject to change with in the next few weeks.